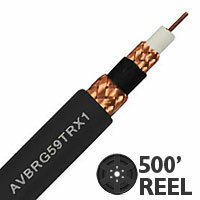 Lake AVBRG59TRX1is a 21 AWG RG6 1-Conductor solid bare copper Triaxial cable, with foamed PE, 90% tinned copper braid, a TPE belt, 90% tinned copper braid. It has an overall mink PVC jacket and is Non-UL Rated. Cable O.D. : 0.360" +/- 0.005"